Is the stage adaptation of the film fabulous – or vacuous? Let’s cut to the chase; what everyone wants to know about the latest Broadway screen-to-stage adaptation is can it be better than its source material? 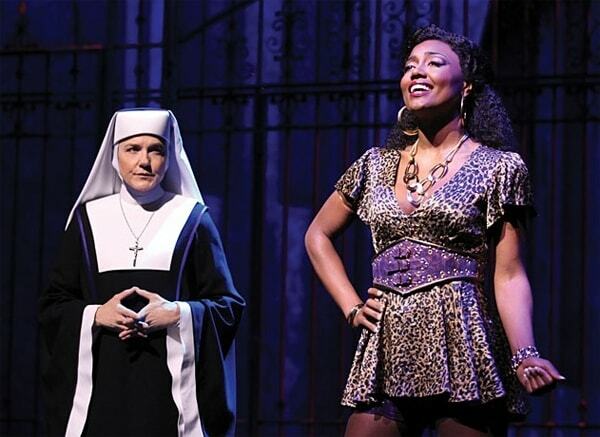 Unfortunately, in the case of Sister Act, the answer is ambiguous at best. Featuring a knockout star performance from 26-year-old powerhouse Patina Miller and a spunky if forgettable score by Disney composer Alan Menken and lyricist du jour Glenn Slater (Tangled, new songs for Broadway’s Little Mermaid, Love Never Dies), the musical falters on occasion despite exploiting its cast’s seemingly unending reserves of energy. Based on the 1992 film, which starred the musical’s producer, Whoopi Goldberg, the stage show eschews the film’s 90s setting (and its recognizable soundtrack, including “My Guy” and “I Will Follow Him”), instead resetting the story in Philadelphia in 1978, allowing Menken and Slater to present a combination of disco pastiche and character songs. The production is faithful in tone to the original film but occasionally seems to pad the story with needless stuffing rather than expanding upon it. Our diva protagonist is Patina Miller as lounge singer on the rise Deloris Van Cartier, who, at the top of the show, walks in on her boyfriend smoking one of his cronies behind a nightclub. Encountering her high school admirer Officer “Sweaty Eddie” Souther (Chester Gregory) when she’s taken downtown as a witness, she’s soon brought to hide at a struggling convent headed up by Mother Superior (Tony winner Victoria Clark, tart and efficient), whose buttoned-up ways are challenged by Deloris’s free-wheeling spirit. Deloris is soon given the task of leading the choir, a job that she takes on wholeheartedly, eventually bringing notoriety to her humble group – both a blessing and a curse for an aspiring singer on the run. Most of what follows is fluff. There are nun-laden production numbers – some of them featuring hip hop interludes, almost all of them featuring ample supplies of sequins – and yet what’s never quite earned is how the convent’s endearing gaggle of tone-deaf celibates (a comic bit is made of their braying tunelessness early on) develop overnight into fabulously soulful choir performers, laying down mad beats and executing any number of death-defying vocal licks. Yes, it’s a musical, and yes, there are suspensions of disbelief inherent in the genre, but Deloris’s “Do Re Mi” equivalent, “Raise Your Voice,” though rousing, doesn’t quite facilitate their drastic transformation. Taking center stage in place of the nuns’ development is the struggle of the church to survive. Saddled with ever-growing debts, the convent is under threat of being bought by two bachelors who deal in antiques (a diversion from the film’s plot); though financial ruination proves a tricky obstacle however, a solution is too neatly found and subsequently inconsequential. Instead of focusing on Deloris’s interactions with her charges, particularly Sister Mary Roberts, a postulant coming into her own, the musical zeros in on Deloris’s combative relationship with the Mother Superior. As played by the ever formidable Victoria Clark, the Mother Superior is appropriately maddening and sympathetic, alternating between steely leader and soft-hearted, humble follower of God. The dynamic between Miller and Clark is taut and provides a winning heart for the piece. Though Clark’s musical numbers are among the least memorable (particularly the dour “Here Within These Walls”), she makes the most of her material, particularly her barbed one-liners, and turns a thankless, covered-up role into one of the production’s highlights. One wishes the same gold could have been mined from Deloris’s relationships with the nuns, who, though each is hilariously funny and talented, never quite become fully realized characters. Though Sister Mary Roberts, played by Marla Mindelle in a breakout vocal performance, is given the chance to belt out a doozy of a number in “The Life I Never Led,” espousing upon her desire to experience life outside the convent, the musical’s script never quite gives us a chance to get to know her before she reveals herself; hers is less of a layered journey than a well-observed but ultimately unearned cri de coeur. Mindelle has been consigned the same fate as Kerry Butler a block away in Catch Me if You Can, gifted a showstopper without surrounding the song with a holistically satisfying role. To be fair, what most audience members will take away from the production is not the memory of its flaws but, rather, its assets. Miller is a ferociously talented stage performer, mastering not only her soulful, rangy vocals but also her effortlessly timed wisecracks, and the chance to see her tear up the stage alongside a wacky bunch of disco-singing nuns (and they really are a joy to behold) makes up for much of the soupy storytelling along the way. Some degree of self-flagellation may be required after the show – it’s definitely, to some degree, a guilty pleasure – but it’s a pleasure nonetheless, thank heavens. Still, it could have been heavenly.